Nick Pearce was off to a flying start joining the Palm Tree Lagoon 400lb Arapaima Club with his first fish of the day, he also caught alligator gar, striped catfish, Siamese carp, Asian redtailed catfish and a huge number of Amazon redtails. 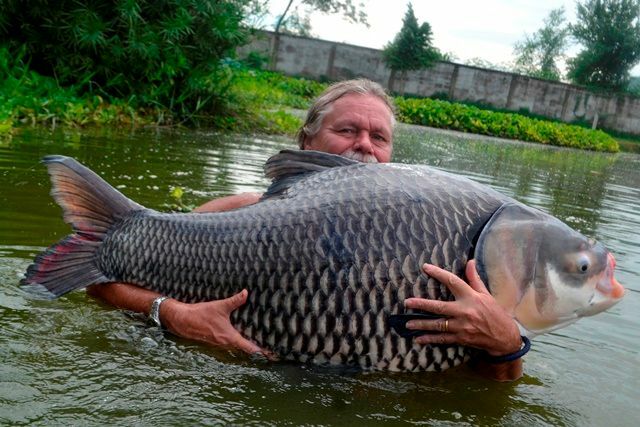 Glenn Dove caught some awesome fish and in the process became the latest member of the ever growing Palm Tree Lagoon 150lb Siamese Carp Club. 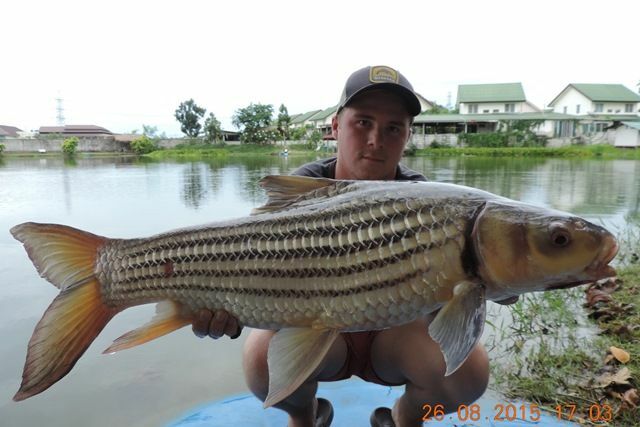 In addition he caught two other rarely caught carp species a high fin barb and a mad barb, as well as many more species that included a beautiful albino chao phraya, mrigal, Mekong catfish, chao phraya catfish, tambaqui, rohu and both Asian and Amazon redtailed catfish. 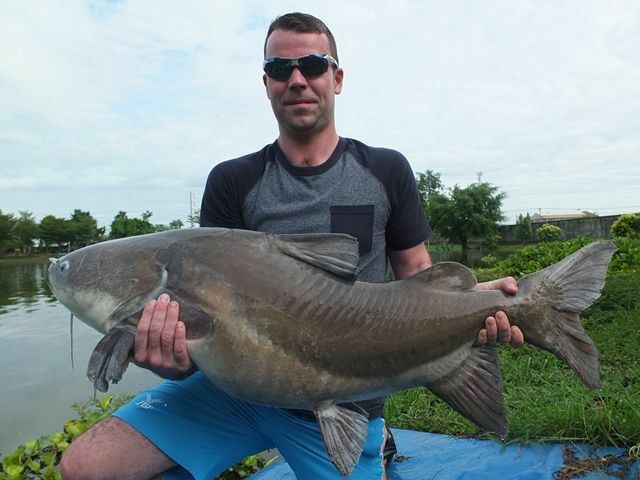 Jason Bolton also has a good session with the pick of the fish being a 42lb Juliens golden price carp which he backed up with more Juliens, some good sized Mekong catfish, wallago attu, a very impressive striped catfish and rohu. 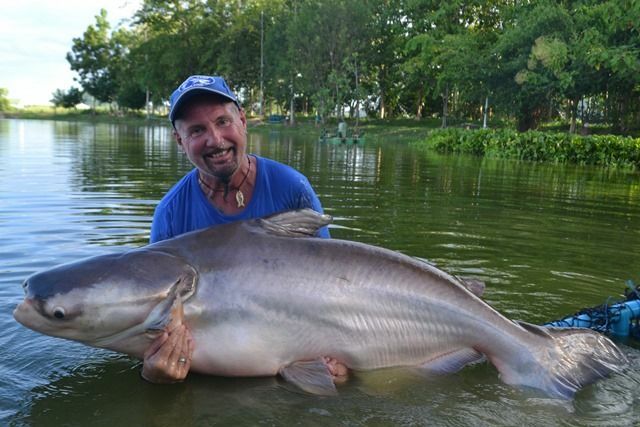 What a session Paul Dove had culminating in the joining of the Palm Tree Lagoon Catfish Club with a 300lb+ Mekong catfish. 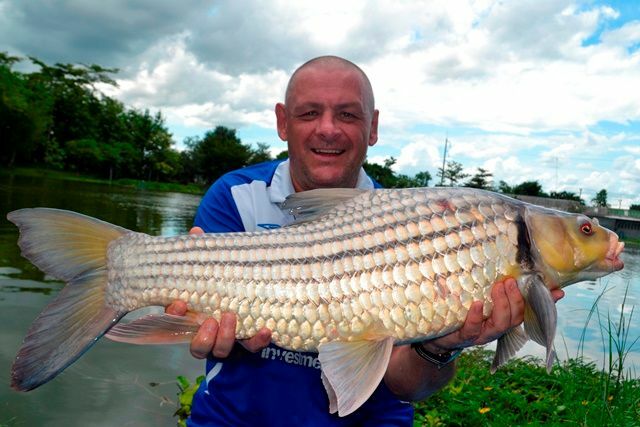 As well as other good sized Mekong he also caught an awesome small scale mud carp as well as Juliens golden price carp, mrigal, a stunning ripsaw catfish, tambaqui, and a number of both Thai and Amazon redtails. Tap was back for his second visit for the month. 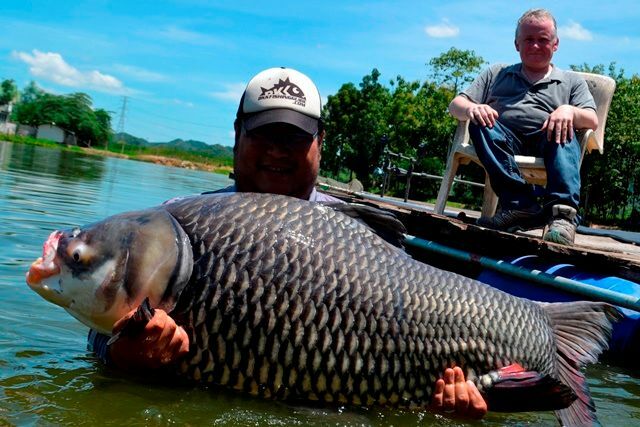 His customer this time was limited in his mobility so Tap had to do the honours when it came tor photos of the big fish namely some fantastic Siamese carp and Mekong catfish. He also caught tambaqui, wallago attu, rohu and a Chinese grass carp. 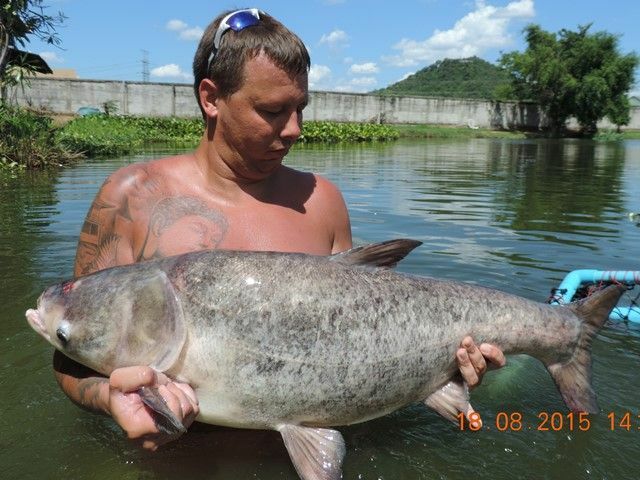 Returning angler Andrew Dove certainly got into some of the rarer Palm Tree species when he was off to a good start with an awesome Salween rita catfish, a stunning Juliens golden price carp and a ripsaw catfish. The catch of the session was a Kali Rohu which he didn't realise at the time was anything special but luckily it didn't escape the attention of our sharp eyed guide who photoed it on the mat before releasing it. 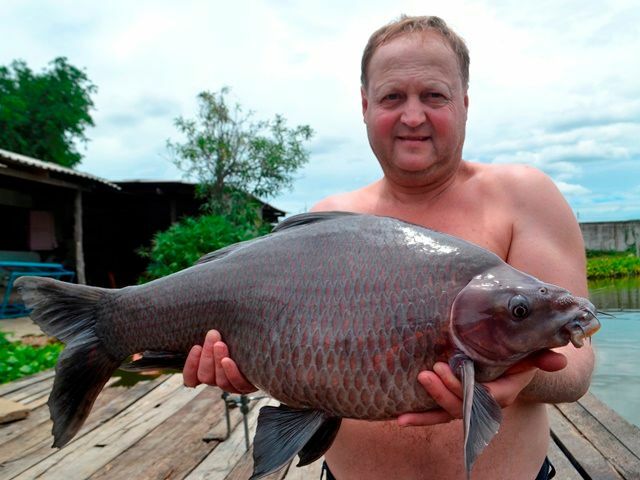 He also caught Siamese carp, tambaqui and a number of Amazon redtails. MickeyPalmer has fished at Palm Tree before on several occasions and up to now had never caught a wallago or a Juliens golden price carp. This was all to change in dramatic fashion with his first fish being a wallago attu and later on in the session he landed two Juliens only five minutes apart and then went on to catch another new species for him in the shape of a black shark minnow. 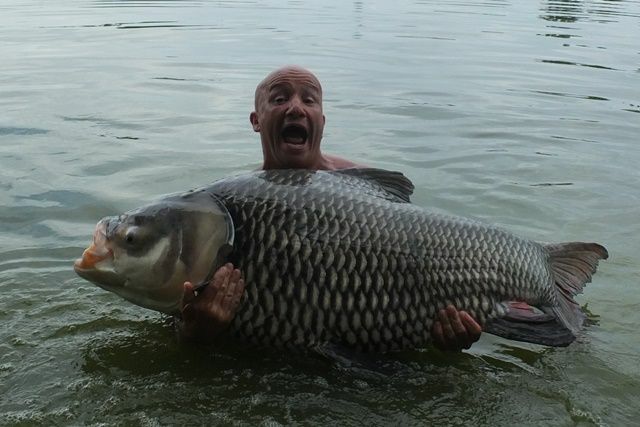 He also finished off with a very impressive 130lb Siamese carp to top off a great session. 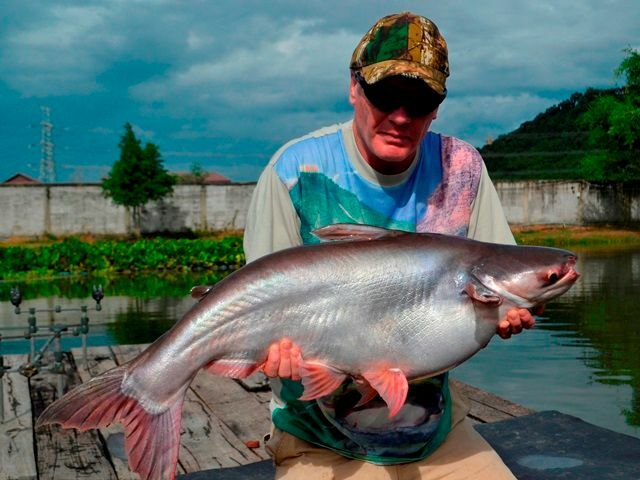 He also caught a number of other species which included several good sized Mekong catfish, rohu, chao phraya, mrigal, and lots of Amazon redtails. 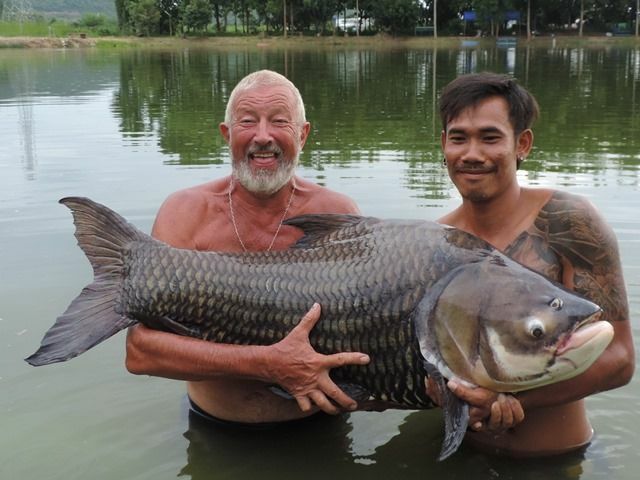 The legendary John Wilson came down with his brother Dave back to where it all started for him as far as fishing in Thailand goes at Palm Tree Lagoon. Between them they caught a myriad of different species that included Siamese carp, what was a pb Mekong for John but escaped before the photo could be taken, Juliens golden price carp, a stunning albino chao phraya, soldier river barb, rohu, striped catfish and a number of Amazon redtails. Harald Klein and his son Daniel (age 11) were back for their annual visit during the German school holidays. 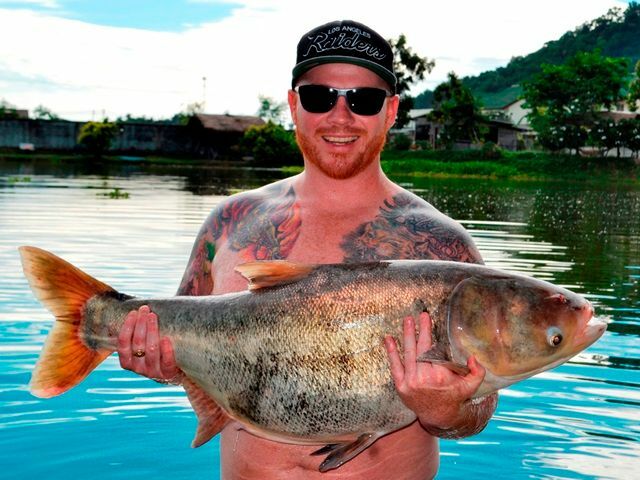 As usual they had a great time catching some superb catches topped off by Daniel catching a 55kg Siamese carp. 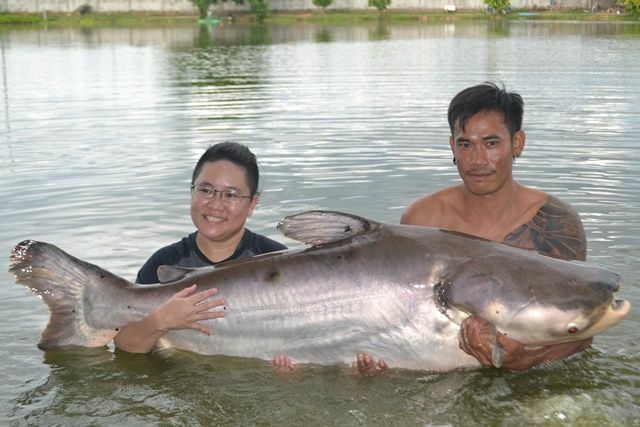 They also landed a number of good sized Asian redtailed catfish, wallago attu, a beautiful albino chao phraya, Juliens golden price carp, a black shark minnow, chao phraya and lots of Amazon redtails. 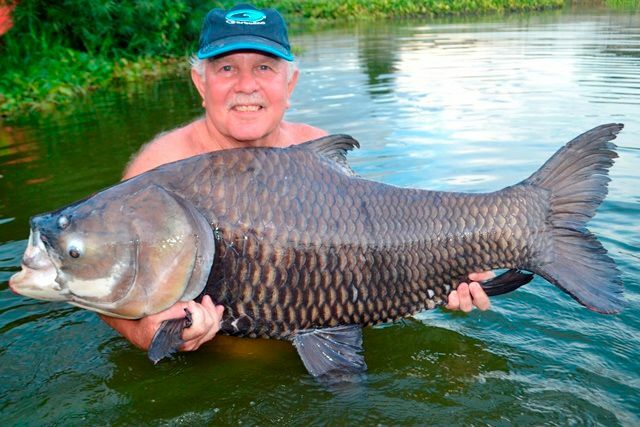 Tim was back again and had a number of Siamese carp to 120lb as well as rohu, tambaqui, striped catfish and Amazon redtails. 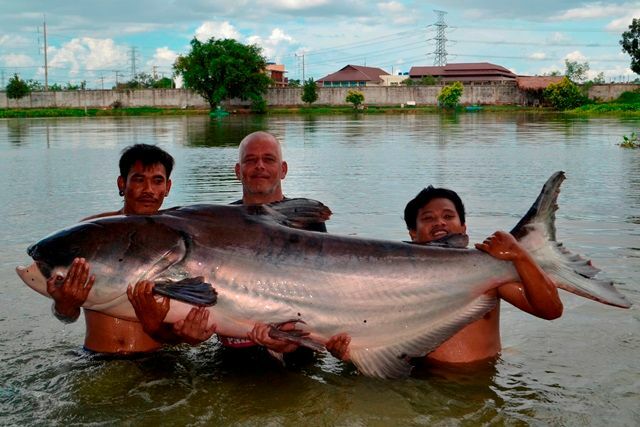 Mickey Palmer went out onto the Mae Klong river giant freshwater stingray fishing. He was very unlucky hooking a monster stingray only to have the hook pull after an hour and twenty minutes of battle. However, he did manage to land a smaller one later on in the day. Regular Sean Skeels came down with his ever smiling daughter Millie. Although he was a bit unlucky loosing several big fish after lengthy fights he still managed to end up with some nice catches that include an awesome Chinese bighead carp and a wallago attu, several tambaqui all new species for him as well as a pb Siamese carp and a number of Amazon redtailos. First time visitor Justin Harrison really wanted to catch a tambaqui, although he didn't get his prize this time he did in his own words do even better catching a superb Juliens golden price carp in the pouring rain. 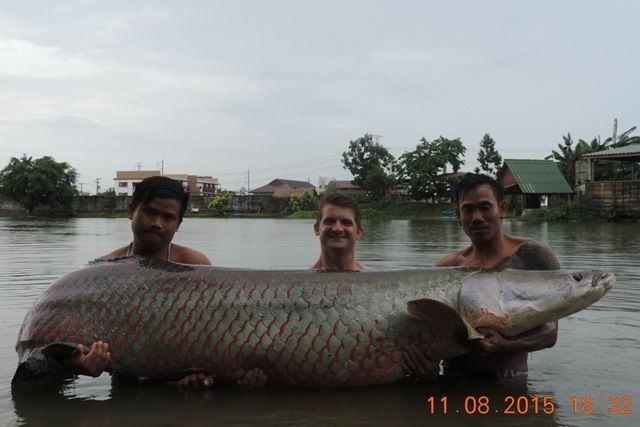 He also caught a mekong which took him an arm aching 1 hour and 20 minutes to land as well as Siamese carp, wallago attu, alligator gar, rohu, striped catfish and a number of both Asian and Amazon redtailed catfish. He says he will be back in the new year to continue his quest for a tambaqui. 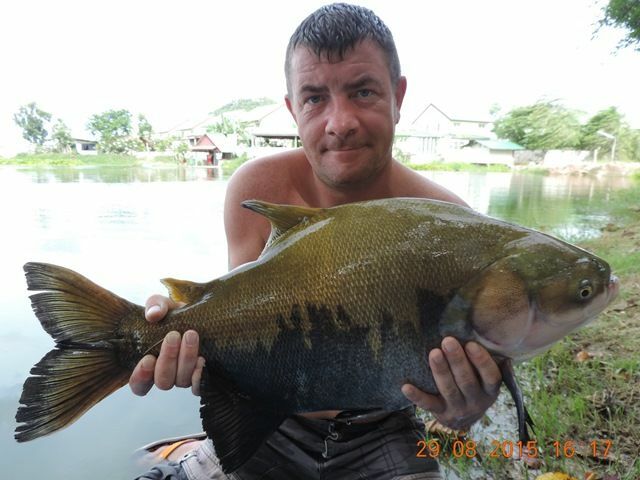 Another first time angler made the trip down from Pattaya and thoroughly enjoyed his stay at Palm Tree. He had a number of great catches that included some decent sized Mekong catfish, Juliens golden price carp, mrigal, mollycot, striped catfish, wallago attu and a lot of Amazon redtails. Peter Taverner made his annual pilgrimage down from Pattaya. After a slow start he ended up with some excellent catches that included Juliens golden price carp, rohu, Amazon redtail catfish all culminating in a pb Siamese carp. Barry Gregory was back fishing bread and paste on a waggler. 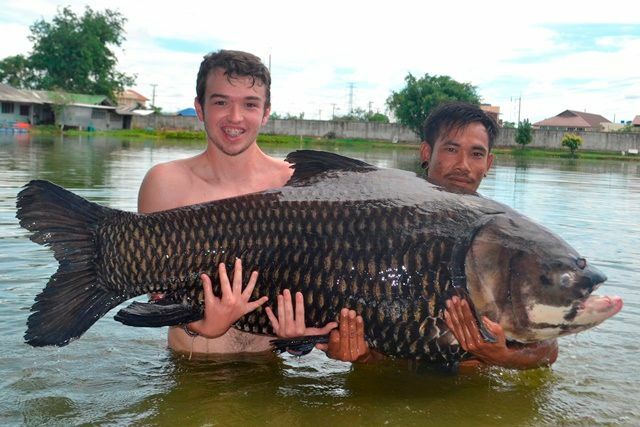 He picked up a number of Amazon redtails as well as Siamese carp, mollycot and rohu. 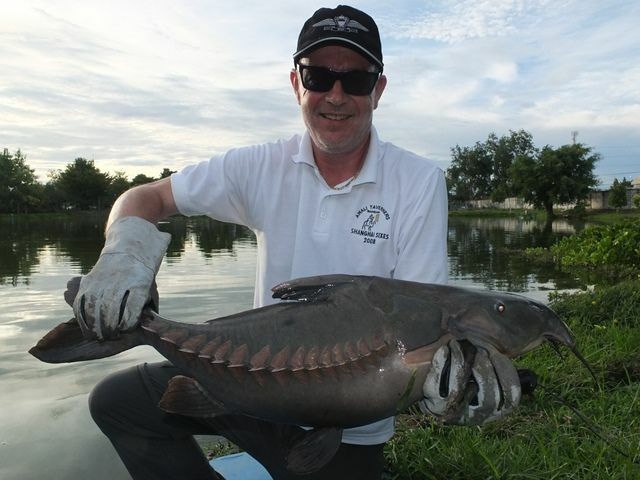 Stephen Brown made his long awaited return to Palm Tree catching a variety of species such as Mekong catfish, mrigal, Amazon redtail catfish, a beautiful catla carp, black shark minnow and tambaqui. Garry McDermott made his first trip down to Palm Tree and vowed to return soon having thoroughly enjoyed his fishing landing some nice catches that included a couple of Chinese bighead carp, Siamese carp and a number of Amazon redtail catfish. 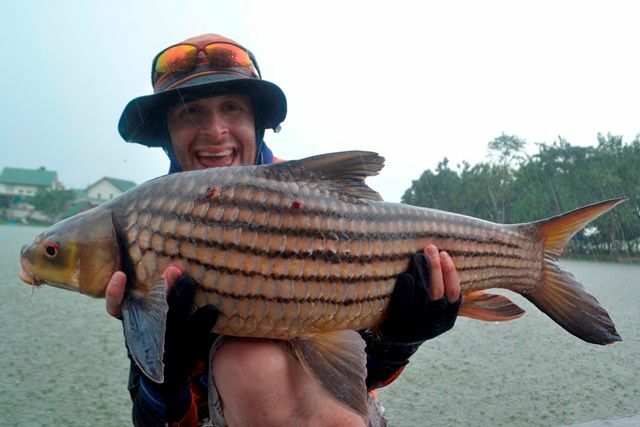 Tap of Bangkok Fishing Guide Service made his first trip down for the month and his customers were all smiles catching Mekong catfish, a stunning albino chao phraya, rohu and a lot of Amazon redtails. Fish Siam Thailand brought down a customer who caught some nice catches that included Juliens golden price carp, striped catfish and both Asian and Amazon redtails. Barry Gregory was down again this time with a customer of his. 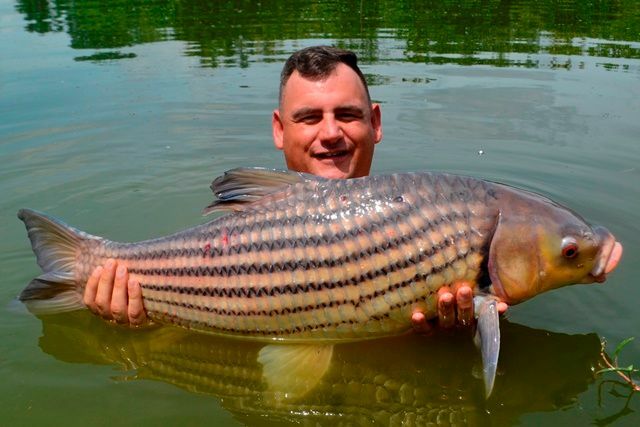 Barry spent most of the day suffering with his back playing up but his customer did catch a stunning striped catfish in the end.